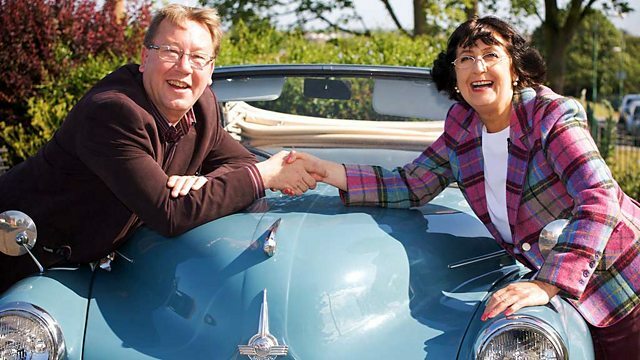 Antiques experts Paul Laidlaw and Margie Cooper begin the last day of their road trip together in Newport, south Wales, before heading to auction in Newent. You might no' be talking but you're breathing down my neck! I'm not talking to you cos I don't want you to read my mind. Oh, come on, you two! Don't go keeping mum. All this way as friendly rivals and now it's suddenly nip and tuck. -Here she comes, here she comes! -Right, I'll tell you what. I preferred it when I was miles ahead of you! in the Alfa Romeo Spider. -Any advance, £20? No? £20 only. That certainly swung the pendulum in Margie's direction. -I think you lost money there. so far brought her £317.36. with £376.78 and a suspicious mind. Are you dressed to kill by any chance? "Mr and Mrs Antique Dealer, is there any way those brooches could be...?" You've got it in one! Ooh, I love it when they talk tactical. and ending up at our deciding auction in Newent. both for its racecourse and its fortress on the River Wye. as a base for their conquest of South Wales. It's reckoned by some to be the oldest surviving castle in Britain. -Good morning, welcome to Chepstow. Dawn, it is great to be here. with the winning post in sight. Stand out at auction and likely to generate a profit. Yep, that's the mantra, Paul. Maybe I should be playing a tactical game here. Parking the bus, I think they call it. Just a nice little Japanese lacquered box. It's lacquered and then gilded, but the gilding's raised. This is a technique called "takamakie". It's not a throwaway piece. So, he is boxing clever. There's another! That's a model of Buckingham Palace, is it not? Tin plate, embossed, transfer printed. See the window recesses there? And then here, look inside, very pleasingly done. It's a model of the Queen's doll's house. to protect the Queen's dolls' jewels. What a lovely little object. Not come across one before. No money, look at that, £12. Easy peasy. Nice, but is that the best you can come up with? Time for a word with Dawn. I'm struggling, I don't mind telling you. What have I missed? We do a lot of antique jewellery here. It's something I specialise in, the antique jewellery. -So is that yours, the material over there? The very rich cabinet to the right. Sounds like he might be about to stray into Margie territory. Turquoise and pearl but it's in lovely condition, nine carat gold. often containing a lock of the deceased's hair. Minute you get hair inclusions half your audience are icky. -Americans love it. The Americans do love mourning jewellery. And that can be 45. -I know. Well, I want you to win, don't I? Hey! Dawn also has a gold chain for Paul to peruse. -I love guard chains, yeah. -Yes, it's quite nice. I do too. of the 19th century with perhaps a swivel to carry their fob watch. is elevated immensely by these, er, little jewels. I wonder what it'll cost, though. I think a fair price on that for you to sell on, maybe 160. -You've utterly seduced me, Dawn. I'm sure she has, Paul! A deal can't be far away now. I spotted this earlier on and fell in love with it. And you also showed me the pearl and turquoise mourning locket. What's the price on the three? Yes, I can see... I can feel it working for you now! I know you've got a price in mind, I can almost see that! you've just extracted from me. That's not easily done. Thanks to Dawn, the floodgates have opened. It's amazing what a bit of gold can do. motoring from Chepstow over to Newport. the Newport poet WH Davies. "What is this life if full of care? "We have no time to stand and stare." -Right, I wish you well. -Good luck. We're both lying to one another! I'm not supposed to be talking to you! -Get in there and buy a clock! -John. Hi, John, I'm Margie. -Right, so I'm just going to have a quick look round if I may. Now, I wonder how Margie's going to play this one. She's so close to Paul that one good buy could easily put her ahead! Certainly won't be buying one of those, will I? Just as one mistake might mean the end! She's clearly learned from her error. a pair of wooden elephants. But this time she's got something very different in mind - crocodiles! -What is it, Mr and Mrs, is it? there are always John's lions. -These are apparently done by, erm, Polish prisoners of war. Prisoner or war work? So there's a prisoner camp nearby? -Yeah, about 20 miles down the road. What sort of money are these, then? £24 for the pair? So you're not highly rating these, are you? Not a great deal, I think you're in with a chance, though. and get down to brass tacks. -They're a gamble, aren't they? -Life's a gamble, though, innit? -You know what? £18 a pair, there you go. Then we've got these two fierce little chaps. -So how much are those, then, John? -18, it's like this is your price today, innit? Despite John's generous discounts, Margie's dithering continues. Time for one more trip around the shop. Nah, I wouldn't look right blonde. I wouldn't like to be blonde, I'd rather be natural. there's still a bit of carving to be considered. Ignore the price on that. Aren't they clever, these things? whereby they stand their brushes in them. -There's a bit of paper inside. No idea. It came with the box. Has that been another dealer had that? they get very optimistic, don't they? When conditions are right, it can grow almost in front of your eyes. Now, can Margie just move along a bit quicker? but it's going to have to be a real cheap deal, that. -20 quid. Oh, yeah, got to go for it. -Hope it does well for you. -Yeah, so do I, John, so do I! Oh, no, John, what have I done? And now it's split there. I've already bought it, haven't I? That's it. I'll tell you what, if you still want it, it's yours for a tenner. -Oh, now I feel awful! -Well, it'll save your bacon. What a nice man, eh? Oh, you're very kind. Thank you very much indeed. I think you got off there very lightly, Margie. No clangers dropped, just a bamboo pot! There's surely a profit now despite the crack. in 1804 of the world's first railway steam locomotive journey. is also the town that the Osmond family traced their Welsh roots to. Kelly, it's lovely to see you. at this establishment. Look at this lot. God, I love that. A telly, isn't it? You know what? I could murder a slice of toast. Here's one I prepared earlier. Nice slice of bread. Hey, are we watching a cookery programme all of a sudden? -Oh, that smells lovely, doesn't it? Once more, look at this! I could do this all day. I'm in my element. Pun intended. But there are a few more practical items to be found up here as well. This is the one I'm interested in. and it protects to a degree against sparks and so on. marks this out as full period as opposed to reproduction. Be interested to see the price on that. That's actually a door porter. Door porter is a door stop, yeah? and have a handle so they can be moved about. This is a Victorian cast iron affair. And it depicts this knight here underneath this Gothic canopy, see? Two good pieces of 19th century domestic metalwork. I rate those. These are good. Or cheap? Did I say cheap? -If we say 55 for the two, is that too much? -Old iron, any old iron. -Erm, could offer you 20 quid for the two. so probably about 35 would be the best for the two. Don't get me wrong, I do like them. We just need something else. Practical Masonry back in the day. And it's quite solid. Oh, look at that! Thomas Conwell owned this book in 1840, that's a joy. But look at these diagrams. They are joyous, are they not? Thomas Telford's suspension bridge over the Menai Strait! Isn't that good fun? I love it. Was exactly the right thing to say, Kelly. I like the two pieces of metalwork and I like the book as well. Can we do a wee bit of a deal on the lot? That was 35. That was 25. Can we knock a fiver off each of them? 30 and 20? -Kelly, wonderful! I shall give you £50. -I'm going with my booty. See you later. Margie's let her hair down in the mountains. so I'm prepared to accept that I'm going to get my hair blown around. once the home of the world's greatest opera singer. the Italian prima donna, then at the height of her fame. She would visit this part of the world. -..and he said, "Well, Craig-y-Nos is for sale." She came up and saw it and bought it. -directly in front of us. -That was built in the 1880s by Patti. By now she was commanding £100,000 for a tour. So she financed it on a tour. Patti's new pad simply had to have an opera house. which can be raised to create a ballroom. That's Patti herself in the backdrop riding a chariot in a Rossini opera. -..because she stayed here for the rest of her life. But she travelled all over the world from here? All over the world, yes, from here. and they would send an engine up. that all of the lights were on green until she landed in her destination. -So she was like royalty? -She was a family friend of the Tsar. -Personal friend of the Kaiser. Napoleon III was at her wedding. -And she sang to Queen Victoria for 25 years. from childhood and remained at the very top for years. her marriage annulled by the Pope. although she belonged to the time before feminism. but it certainly wasn't in the 19th century. ..of being a woman in those days. But surely that would be very exciting for her. Why didn't she want to? -Well, because of the quality of the recordings in those days. -and she was asked again and she said she would. But only here at Craig-y-Nos, in her boudoir. CRACKLY RECORDING: "Home Sweet Home"
And then go into the low notes into the horn. If you did it the other way around, it was unintelligible. according to the technical needs of the time. and she said, "Before I continue, I want to hear this." "Now I know why I'm loved so much." and are now all we have to remind us of the voice of the queen of song. Margie still has a certain "tenner" on her mind. -and guess what I did - I dropped it after we'd done the deal? Nothing like a bit of sympathy, is there? Night-night, you two. As the deciding day dawns, our two look back on a tumultuous week. Ups and downs, ups and downs. Have you ever played Buckaroo? leaving her with over £300 to spend today. You have utterly seduced me, Dawn. ..leaving him with just over £125 in his wallet. -What's platinum scrapping at at the moment? Let the mind games commence! but our next stop is Narberth. Narberth was where the leaders of the Rebecca Riots were imprisoned. and that rarely bodes well. -Welcome to the Malthouse in Narberth. I'm Peter, this is Jimmy. -So, is everyone introduced now? and start scouring for the several purchases she needs to make. That was my first dinner set when I first got married. God, doesn't it look dated now? While Paul's in an altogether different frame of mind. I'm looking for that thing that if I don't buy it, Margie might. At that price, I've got to buy it, I've got to buy it! I've got to stop her buying it. Shame on you, Paul. Margie's got enough to worry about. 207 for a glass ventilator? That's not a good look. You're sweating, you're sweating! You're not wrong. You're not wrong! Why not cool off in another part of the shop, then? probably early 20th century, that. But we've got a heart-shaped ticket that says 165 quid. Is the heart shape to soften the blow? I can't see that coming down to my level. No need to worry about Paul, either, Margie. Languor with just a hint of smug, I'd say. I wonder what Pete makes of the mirror, especially the price bit. I just quite liked it. But I don't think it's very old. -Has it got a price on it? -Yeah, it has, it's got 165 smackers on it. What were you thinking, we'd be looking at, 90? What price have you got in mind? I suppose I would want to be buying that for about 70 quid. Pete's gone a bit pale. I think 75 would be a fair price. I've gone from laughing to drumming. Could you go from drumming to yessing? Are we still negotiating here? We are. I think we might be. You're in it for the long haul with Margie. -It's decorative, that's one thing. -I'm old. Does that help? We've all just aged considerably, Pete. if I make a tenner, I'll be happy. I won't dither any more. -That's it, we've done it. I just hope the rest of her shopping won't be quite so protracted. Paul's taking a leisurely drive towards the Pembrokeshire coast. Travelling from Narberth to Fishguard. was the site of the last invasion of Britain. and stout locals, they soon surrendered. Paul's here to see a 1997 tapestry which tells this fascinating story. -Hello. Would you be Mary? It's good to see you. And this is it. It's exquisite, isn't it? And we're very proud of it here as well. this is the Down Bay-eux Tapestry. The French hadn't really intended to invade Fishguard. just as other divisions made for Newcastle and Ireland. and that legion straightaway encountered fierce resistance. The local people are also getting involved. -These are the ones with the pitchforks! coming to the aid of the Fishguard soldiers. But the real work, it seems, was done by everyday heroes. which in English means "Big Jemima". that there were more soldiers than there were. which is across the road. -Right, so she got in the thick of it as well. -with her pitchfork on a dark night, I'll tell you. with the formalities concluded down in the pub. What becomes of them? Do they ever see France again? -chilling proof that this ripping yarn was very real. -But don't point it at me. what a thought. Now it becomes real, doesn't it? We're touching history. I see a date there. This is our date. so they decided to issue the first paper pound. we're holding things that come about, in a sense, because of this. as our trip moves a few miles up the coast to another Newport. somewhat desperate Margie's on her way to its only antique shop. is that most of what's for sale is a bit of a foreign land to her. -We don't do silver and jewellery. -We do do a lot of other things, though. Railway armour too. Lots of that, just up your street. It's a tricky one, isn't it? Do you understand all this stuff? -for quite a few years now. -Tell me. That's a whistle. -That's from a shunting engine. This one dates from 1950 and it's a British Rail one. with Thomas the Tank Engine? Ah, Skimbleshanks, he's got to be lucky, that fella. You've got a nice little marking, haven't you, hey? Doubtful provenance, though. How about a whip holder instead? For when you're driving your carriage. You store your whip in there and then it's ready to use. -I should think so, yes. and he'd have his whip in there for when he wanted to whip his horses. It was a convenient place to put it. If you put it anywhere else, you'd lose it, wouldn't you? Course you would. Go on, have a crack at it, Margie. -No, that is too little, really. -I'll have it for 20. Good work and it now seems there's some silver here after all. I must admit, it got lost at the back of the cupboard. -You never thought to get that out for me? -I thought it was plate. I had seen it and I just thought it was plate because it looks awful. -Ticket price is £48 but it's a bit damaged. -What are you offering for it? -I was going to say 15, 18. If you give me 20 for it, I'll go for that. I'm not going to argue. I'm in too much trouble to argue. but I think she may have to head off piste again to get it. I think a surveyor would have used this tripod. you know, these spotlights or these film lights. That would look very trendy in a corner of a room. It's just in, though, so there's no ticket price yet. I want to end this. I've been in here too long. We're all a bit weary. What's the very best on that? -30 would be the best for that. -Will it? Not another fiver? No, I think 30 really is the best. -Oh, God, what's a fiver between friends? Well, that's quite a little collection you now have, Margie. Gosh, after all that. We did it. So, shopping completed, let's have a look at what they've got. a cruet set and a mirror for £145. looks like a profit. Holy Moses, it could make £200. don't know what he did in that shop but whatever he did, he can't lose. The question is, has she pulled it off. The answer is no. I'm going to jump off the edge. Bye. of our trip concludes at an auction in Gloucestershire at Newent. Have you practised your, "I'm dying but I'm cool with that smell?" Have you practised that? Is that rigor mortis? -I can take this with good humour. -British group to top the US charts. -Turn it on, Margie, this is it. But which of our pop pickers is going to make it here? Let's hear what auctioneer, Rita, makes of her prospect. here in Newent. I'm not sure about that one. It may not perform as well as I would like it to. -Take it away, Rita and the team. First, we have Margie's silver cruet. Someone start me at £30. £30 for the cruet set. Start me at 30. Oh, I've got 32 on the net now. 34 now. Look at your little face lighting up. -36, 38, looking for 40. 44, 46, then, looking for 48. -I've come over all cold. -46 in the room, then. You all done? You all finished? Selling at £46, then. -Lovely lady on the rostrum. She's already cut your lead a little, Paul. Time to fight back with your fender and door porter. Interesting, this. Start me at £30 and I'm looking for 32. -32, 34, 36, at £36. -At £36, then, are you all done? That was it, Margie. It went with a whimper, but it went. A bit of a disappointment, though. -But can Margie's bamboo with a crack do better? -Can I see £20 for it? -£20 I'm bid. Looking for 22. 24, 26, 28, looking for 30, 32. I've got 30 in the room. 32, 34, 36 on the net, looking for 38. -Bless it and I dropped it. -Perhaps you should drop it again. At £44, are you all done? Margie is closing in now. Time for Paul's big buy. It's still a very good price, though. I feel sorry for the woman you bought it off. Poor soul. She obviously rather liked you. and I've found a woman that liked me. -Someone start me at £200. It must be worth that. £200. Coming in online? -£150 in the room at 150. 160 online. -190, looking for 200. 200. 210. Looking for 220. 220. 230. At £220. Put the hammer down, will you, please, love? All done, selling at 220. It could have been worse... for Margie. I'm surprised you didn't do better with that, I really am. Watch out, Margie, it's Paul's other bit of jewellery. Is this the same lady that you were left alone in the shop with? -Commission interest starts me at £50. -Now I'm looking for 55 and some. -55 I have. I'm out looking for 60 now. -You're not very lucky, are you? Another profit. But Paul can still be caught. He's got high hopes for his Practical Masonry, though. I feel one of my headaches coming on. Interest in this starts me on commission at £30. -And I'm looking for 32. 32 on the net and I'm out, looking for 34. -At £32, then, are you all finished? I'm selling at £32. £300 to £500 book just made 30 quid. Oh, well, that's the way of the trip sometimes. I did something really bad in a past life, didn't I? Now, what does Newent see in Margie's mirror? See if this mirror takes off like a rocket. I shall demand a recount. Someone like to start me at £50? £50 for the mirror? 50 anywhere? Start me at 30, then. £30 for it. -20, someone start me at £20. £20 for the mirror. £10 for the mirror. 10, must be worth that, must be worth £10. Nobody want it? No offers? No? I think we'll have to pass that lot. -What am I going to do with it? It's the last auction. It will grace the Road Trip office I'm sure. Paul's looking pleased. If only you had a whip to go with your holder, eh, Margie? 20 for the whip holder. £20. 20 anyone? -£10, then. Start me at 10. At £10 in the room, looking for 12. At £10 now. At £10, then, selling at 10 in the room. I'm on the "slippery" now. She's right. The game looks to be up. Paul's little doll's house moneybox now. -I honestly refuse to make any forecast. Someone start me at 20. 20 anyone? £20? Someone start me at £10, then. Nobody want it for 10? Nobody want it for £10, then. No? So much for our experts, eh? But at least Paul's lost a lot less than Margie. Oh, got my tripod. Oh. The auctioneer predicted this might be a bit trendy for Newent. I'm frightened. I'm not just desperate. how are we going to get a tripod? You could always leave Paul behind. Interest in this starts me at £32. At 38 now, looking for 40. 40 on the net. 42, 42, looking for 44. 46, 46, looking for 48. 48, 50. At 48 on the net. At 50 on the net now. Looking for 55. -Well, blow me down with a feather. -55 now. Make it 60 online, then. -We don't know nothing about this trade, do we? Are you all finished online? Selling at £55, then. Should help a couple of badly bruised egos. -I'm telling no-one about this. -Seriously, we're in this together. Right? Your secret's safe with us, Paul. No-one need ever know. a loss of £17.90 leaving her with a final total of £299.46. which means he's the winner with £408.04. Now, remember, drive safely and always check your mirror. -It's been a wonderful week for our duo. Look at the views, look at the views. pair of experts, Thomas Plant and Anita Manning. Am I going to be the winner on this one? -..and Thomas dazzles us with his knowledge. Antiques experts Paul Laidlaw and Margie Cooper begin the last day of their road trip together in Newport, south Wales, before heading to auction in Newent. Paul is in the lead but Margie is snapping at his heels. Who will go on to win as they go head to head at the final auction?